PRAN Card is Permanent Retirement Account Number Card. It is a 12 digit unique identity number issued to persons who register under national pension scheme (NPS). 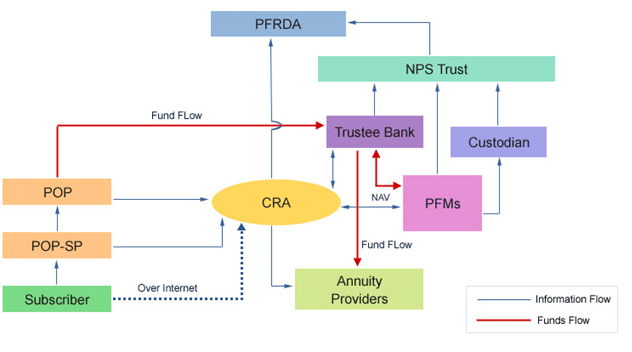 NPS is governed by Pension Fund Regulatory and Development Authority (PFRDA). NSDL has entered into an agreement with PFRDA for setting a Central Book Keeping Agency (CRA) wherein all the details of members of NPS are stored. So NSDL is authorized to issue PRAN. 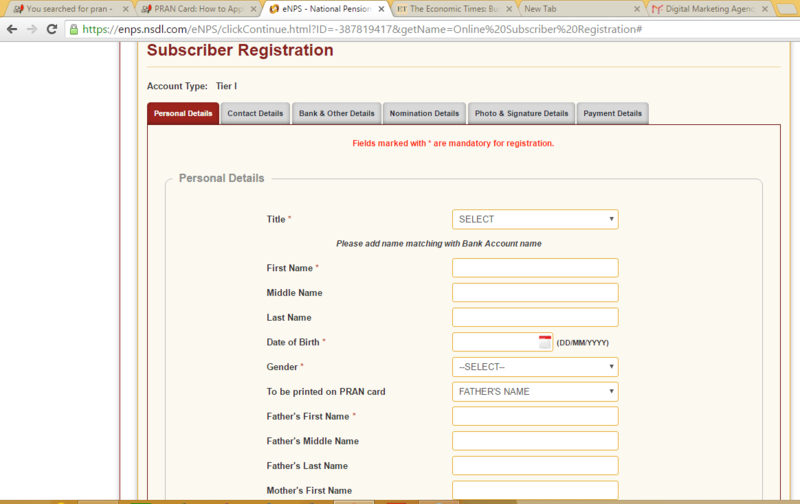 Applying for PRAN is the first step for having NPS registration. It is just like to have a PAN card before filing your income tax return. Step 1: keep all required documents for PRAN with you. If PAN is not available then you can have Adhar card. Scanned copy of photograph and signature in peg/jpg of 4kb – 12kb. Debit/credit card/ internet banking information for online payment. 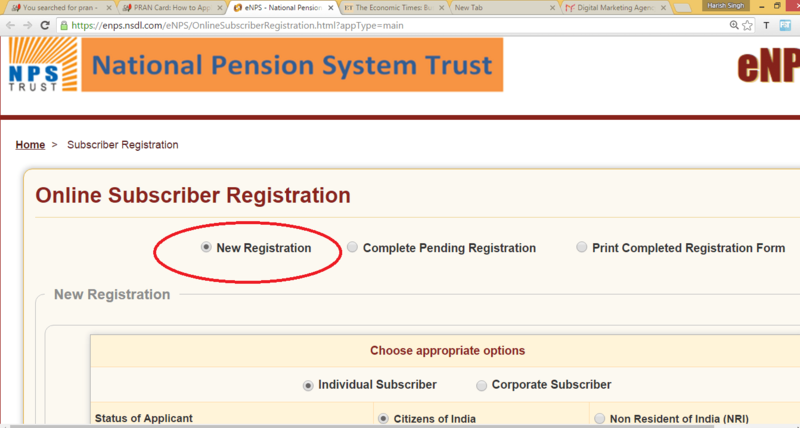 Step 3 : Choose the new registration option. 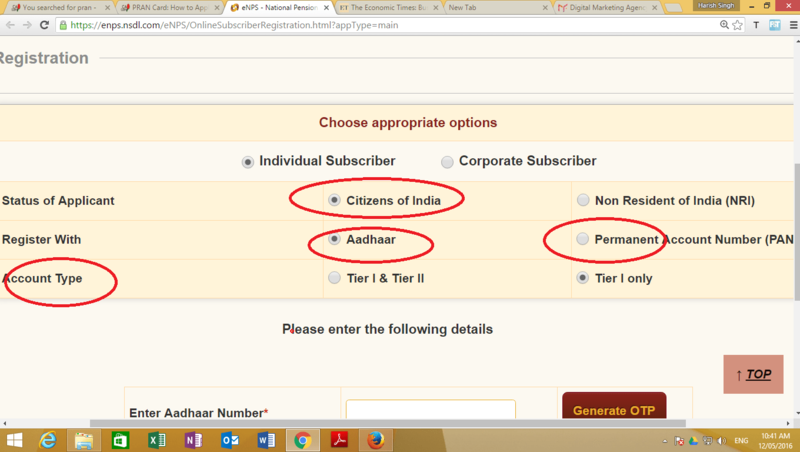 Step 4: Choose Citizen of India, then you will have to choose PAN if you have PAN otherwise Adhaar. 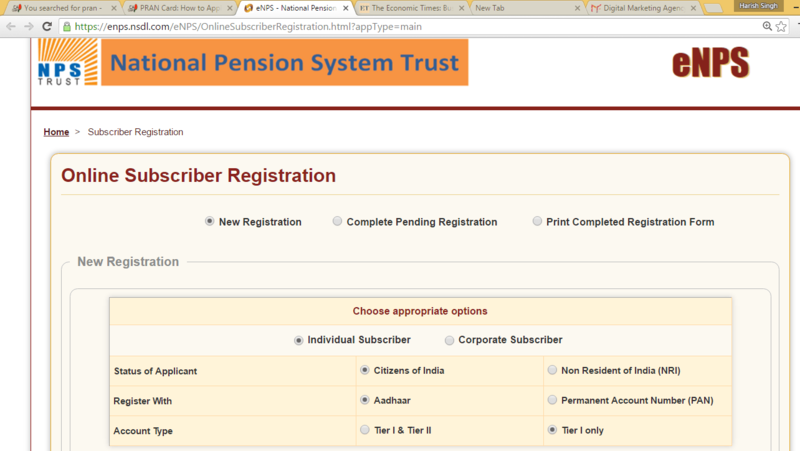 Check here the difference between the Tier I and Tier II account of NPS. Tier I Account required for long-term savings. It is eligible for Tax benefit upto Rs.50,000 u/s 80CCD(1B). Tier II Account is an add-on account which provides you the flexibility to invest & withdraw from various schemes available in NPS without any exit load. Step 5 : Enter Your PAN number. Step 6: Select the bank with whom you have a account. Presently there are limited bank in the list. 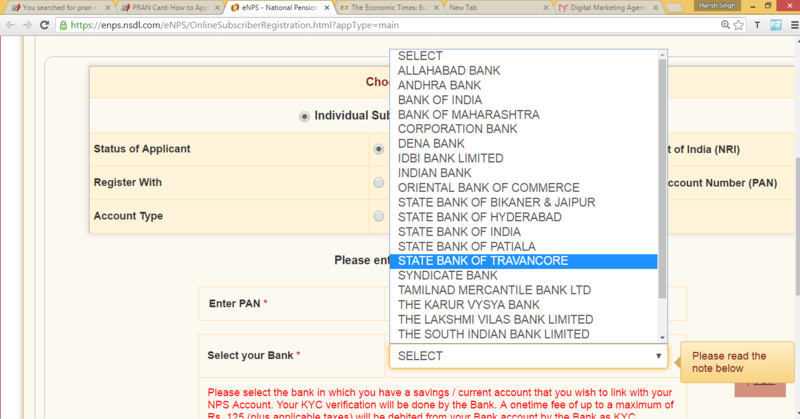 if your bank is not there in the list then you can apply PRAN offline. However, there are many more banks who are appointed as Point of Presence. May be the NSDL do not have agreement with them or they may be added in near future. Personal Details : After filling the personal details, a acknowledgement No. will get generated, through which you can fill the rest of the form later. Step 8: After payment, PRAN number will be allotted. You will receive the PRAN card to your registered address. Once you received your PRAN No. Online, you should wait for PRAN CARD. You can check the PRAN status online. If there is any delay then you can check the PRAN card Status by calling in this number 022 – 4090 4242. 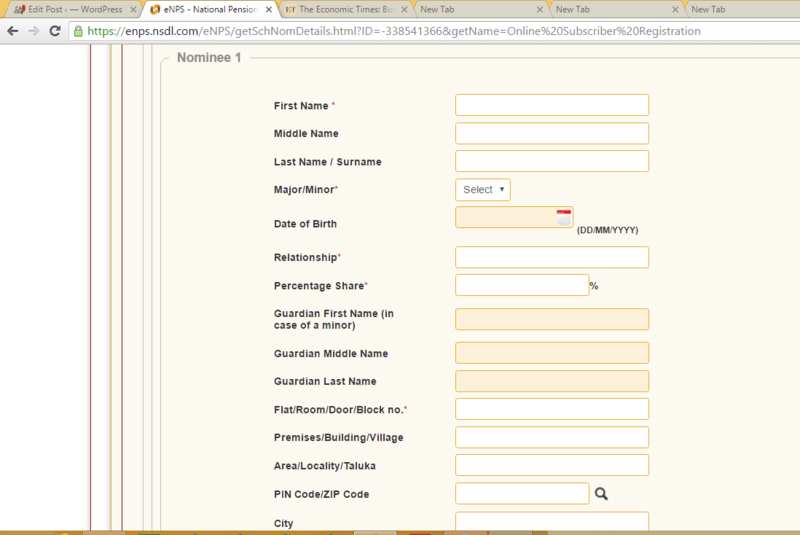 If you are not able to register online for NPS, then you can download the PRAN form, fill it and submit it through post. How to contribute to NPS ? With your PRAN number details you can contribute to NPS by online facility. Hope the procedure for online application of PRAN card is clear. For any query please comment. you can check the PRAN card Status by calling in this number 022 – 4090 4242. Yes you can use your PRAN number. 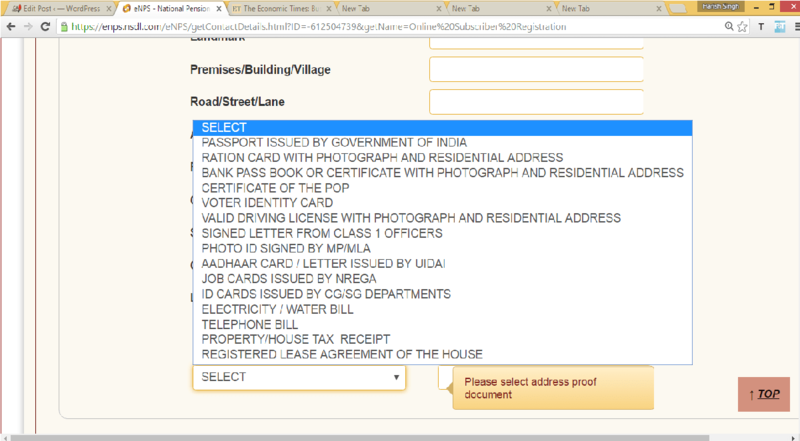 goverment employe can apply online for pran card? 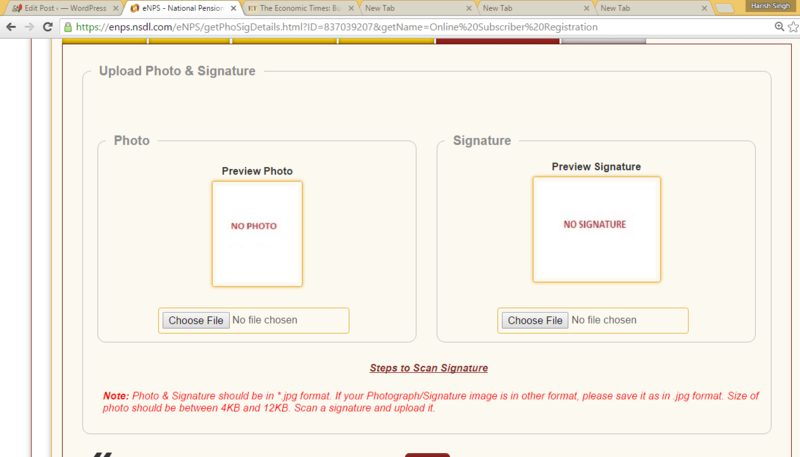 my photo and signature not uploaded. I am a govt teacher,joined on 2013 ,but still didn’t get pran card and kit,what should I do? They will guide you to get your PRAN Card. Can Government employees online application directly for pran card without head office forwarding? ? Any body can apply for PRAN card. But if are government employee, the employer must have initiated for the process. So ask them about its status. Sir I have got my pran card. I applied for it personally without any involvement of dept…how can I give the information to my dept now? I mean how it can be linked to my profile in my dept. I am govt. Teacher. My cpf account is open in 2011 but i have not prankit…. Without prankit via sms alert i check my balance…what is the process. Give me any process for check my cpf balance online without prankit…..
You must have your PRAN No. If not, then contact the officials and get your PRAN No. Why is it not neccessary of govt imployyee joining details in online pran form…is it correct..
Because NPS is for everybody not only for government employees. Any body can join this. I have taken APY at last year but still i did not get the PRAN no.. and i am not able to check my account balance of APY. Can you tell me how i will get the PRAN no. how can I get back my PRAN number if I lost my PRAN account or issued by your prestigious authority…. please let me know or do me favour by sending all the details if card is lost to my Wats app number i.e. 7411048446. I want pran card, what i have to do, to get the card. Please help me. I AM GOVERNMENT EMPLOYEE. I APPLIED FOR PRAN CARD ONLINE BY ENPS WITH TIER 1 AND TIER 2. NOW WHAT IS THE NEXT PROSSES. 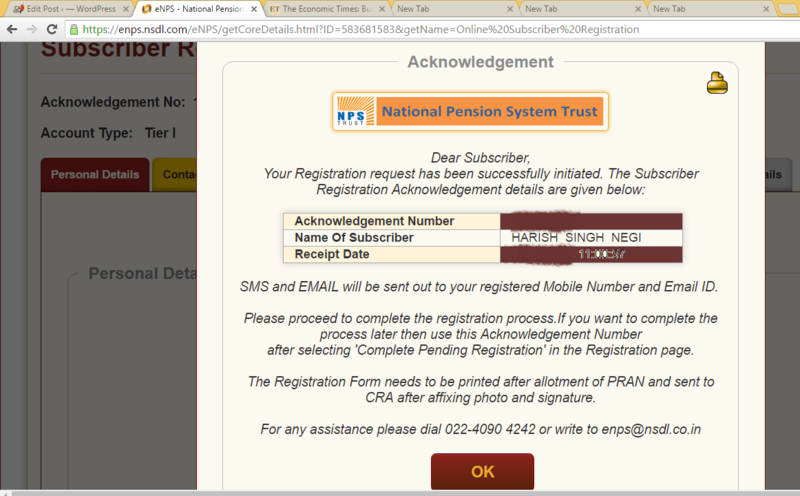 Today I had open my NPS account and I had received my PRAN number. As soon as possible I will forward the PRAN form to the CRA office. Once the form is received to CRA office in how many days I will be getting my PRAN KIT ?? I had checked on some sites might be it will be coming in 20 days but I had saw many comments and complaints that many people haven’t received the PRAN kit even they had received their PRAN number or applied for the PRAN long back. Also, I need to show the NPS contribution in my Income Tax submission proof. 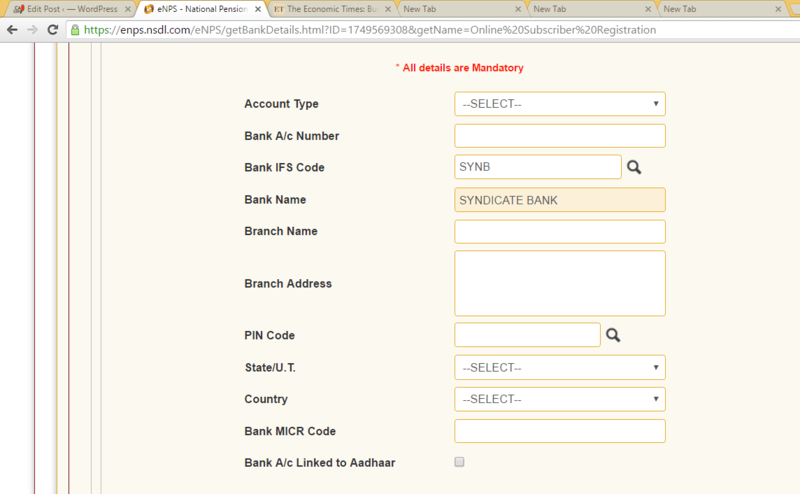 So, Can I show the account opening receipt of NPS which I had received after NPS registration ?? In my Income Tax Supporting documents – Can I submit only one receipt which shows that I am investing money in the whole year as per my declaration. For Ex- If I had declare I am investing Rs. 12k in NPS & Rs.12k in PPF. So, Can I submit only account opening receipt for time being and rest money I will be invest before the end of financial year i.e March or I need to submit the receipt from April to current month ((individual receipt of each declaration) for showing my ITR supporting documents. 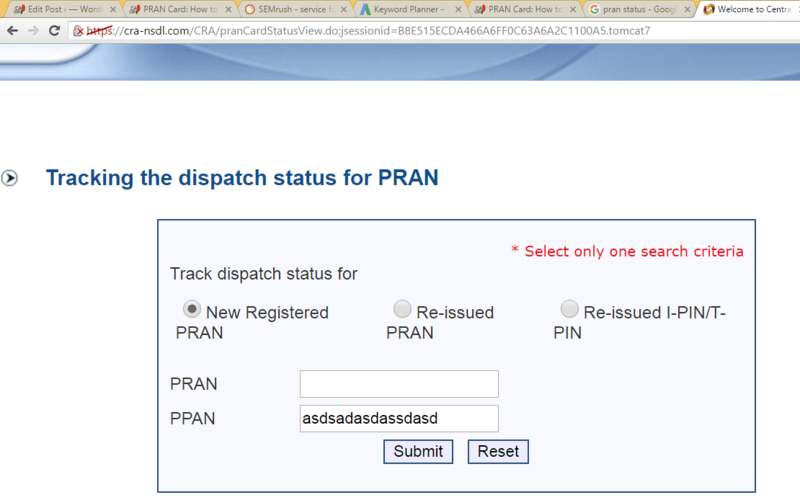 Is govt employee can apply for PRAN online without head office sign or stamp or forwarding??? I filled the form online and took the required printout. But in the printout, one the second page, nomination details didn’t appear. The nominations are filled properly and appear on the additional information page in the form. Should I fill the nomination details and then post or is it ok if I post directly? i am private employee. how to apply in pran card. Just go through the steps mentioned above, if you face any problem, then ask. pop registration can be changed to dto registration or not…..i have applied online pran….bt it seems different than other punjab govt employ when we login through ipin….plz guide wt i have to do so i can register in punjab govt treasury…. Thanks for your given information and it is very much worth for all people. You are a STAR ! you truly deserve a Hats-off ! I m gov. Teacher. I applied pran through online. I got my pran number and pran card. Can i direcy use it for my salary account or any other process remainig through my DDO. Someone tell. Me that its compulsory i submit ISS-1 form to district treasury through my DDO. Is it compulsary? ??? what is the benefit of investment to NPS Tier I account . Sir,How much i want to pay and how much i will get.Please explain brief about this plan details. Is this PRAN applicable only for Govt Employees? Applicable for all who wants to join this scheme. Yes you can. Any body can invest in NPS. How much interest will be earned on NPS? Thanks, I was searching such kind of details about NPS. Sir, I will get only EPF pension. My retirement date at 60 is 30.11.1919. Now only I joined in NPS. I have deposited Rs.50,000/- in NPS on 17.02.2017. I am planning to deposit the same amount for the next 2 years ie Feb of 2018 and 2019. Will I get tax benefit ie up to 2.00 lakh in 80 CCD for the next 2 yrs if I deposit similarly. Also I wanted to know about the returns from this ie pension and others if any. Kindly reply. Hi, You can claim the benefit of Rs. 50,000 under section 80CCD(1b) for each year of payment. Hi, You can call these number. Sir,i can pay rupees 50 thousand for this year’s investment.in next year I will not invest .is it lawfull as per NPS scheme. I have received my pran kit. and contribution also i made. but i got message my account has been frozen due to not submitting the relevant papers. Hi, I have the received the PRAN Card but not received the pin. Requested you to kindly provide the details from where and how can I apply to get the pin for my PRAN CARD. Sir,. In my pran card name one letter mistake. Please rectify and new card give me. Thanks for sharing the relevant information. Could you please let me know the steps that i need to follow to complete my NPS registration. I have used ONLINE SBI to complete online NPS registration with POP-SP as SBI. A CSRF1 form has now been generated with prepopulated details. Shall i go to my SBI branch to submit the form? Or shall i courier the form to CRA? How the PRAN will be activated at NSDL’s side? And how will i receieve my PRAN Card? Dear sir,I am an state govt employee.I had once opted for Atal Pension Yojna in 2015 when I worked under contractual post.After opting APY I have been given a PRAN number.But now my department is going to render me PRAN n NPS.Will there be any problem if I get two PRAN numbers?? meri mataji ka 28 march 2017 ko death ho gaya hai. mai kaha aur kaise claim kr sakta hu. nps ka sabhi document hai. nominee bhi mai hu. Its been 8 months when i filled the form and submitted to my employer bank i.e. Syndicate bank. My PRAN is still not issued or delivered to me but NPS contribution is being deducted regularly. Kindly guide what to do. kindly inform that, after my 60 years i will be eligible to get the pension. If i died before or after my 60th age, is my nominated person will get the total money or not. i am govt. employee. is it apply for pran card online without forwarding to treasury. it is not possible to registered through passport not Adhar or PAN card. we living aboard and how to register with OTP code. Respected sir,I am a govt employee,regulated three months ago.plz tell how to open Pran card and how to submit at office. I want to open nps account. But I have difficulties when I fill contact detail on this page here FACTA detail is mention but don’t know this and I also do not have pran no. How can I get this. I RECENTLY JOIN INDIAN RAILWAYS. CAN I APPLY FOR NPS AND PRAN BY MYSELF(ONLINE). IF YES,WHAT SHOULD APPLY FIRST NPS OR PRAN ? I m govt employee having DCPS No with me. Office do regular ducttion of DCPS amount contribution each month i m not able get it online. I have question that DCPS No and PRAN no is same or different, is there any relation between Both no and how to get PRAN No if have a DCPS no with me. Sir maine account open ke time hi apy form fill kya tha and I have a pran no. Also but till now I didn’t receive any card. How it will get. Sir, i want to withdraw some amount from the NSDL account, how should i go for it, i have completed 13 years of my service, please advise as it is very ugent. Sir they are asking fatca details in registration of NPS. Where do I get from? I have an account in IOB that is not in a list what can I do? I have my pension account with my previous employer and by mistakenly I have not opted for EPS with my current Employer. But I have no idea of my PRAN number of my previous pension account. I now want to apply for EPS with my current employer and also want to know the PRAN. I have my pension account with my previous employer and by mistakenly I have not opted for EPS with my current Employer. But I have no idea of my PRAN number of my previous pension account. I now want to apply for EPS with my current employer and also want to know the PRAN number and further process. Before 60 years i have an accident or dead what is the status of my amount. Can my nominee withdraw the amount. i have a nps account but still not received PRAN NO.